Welcome to a new year of CSN’s “Stormwater Spotlight”! To kick off 2019, we are heading out to Delaware to learn more about how the Delaware Department of Transportation and New Castle County use their NPDES map viewer to collaborate and manage their stormwater infrastructure. Maintaining an inventory of thousands of storm drains, outlets and best management practices (BMPs) can require a tremendous amount of dedicated staff time. To help stay organized, many communities are implementing stormwater asset management software to track inspection dates, BMP locations, and citizen complaints. 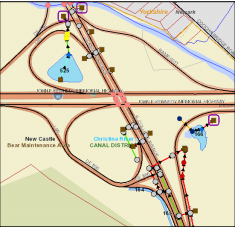 The Delaware Department of Transportation (DelDOT) and New Castle County have recently upgraded their asset management software, the “NPDES map viewer”, to improve their inter-agency collaboration and streamline their workload. DelDOT and New Castle County were issued their first joint Phase I MS4 permit for 2001-2006. With that permit, they conducted an initial inventory of stormwater assets and created the NPDES map viewer to help track them into the future. Over time, their inventory expanded – thanks, in part, to new MS4 requirements and the Chesapeake Bay TMDL. Today, DelDOT is responsible for managing 45,000 pipe inlets, 7,200 pipe ends, 3,000 swales and 370 BMPs within the road right-of-way in New Castle County alone. In addition, the County is responsible for an additional 2,300 BMPs in public and private open spaces. A screenshot of the Map Viewer shows BMPs (blue-shaded polygons) along a highway in New Castle County. The new NPDES map viewer is an all-in-one tool that geo-references each stormwater asset managed by DelDOT and New Castle County. DelDOT and New Castle County decided to build a custom inventory database using KCI Technologies, rather than using an off-the-shelf product such as Arc Collector. This customization allows for advanced queries to filter the inventory. The tool is flexible and includes all the information staff need to inspect and maintain old BMPs, as well as plan new implementation. Thanks to the strong philosophy of collaboration and coordination between DelDOT and the County, both the stormwater collection system and their BMP inventory are integrated within the map viewer. Both entities are then able to input their data into the system with consistent formatting and QA/QC so that the automatically generated reports can be sent to the state for their MS4 annual report. The tool has a number of uses that allow staff in different departments to coordinate efforts and track them for future reporting. For example, field crews can pull inspection reports for any asset to see if a new inspection is needed. If an asset requires a new inspection, crews can take a live version of the tool out to the site and provide notes on any needed maintenance, and photos of the current condition. Any maintenance needs will then be integrated into their work order tracking system. The current work order tracking system is being transitioned to a geospatial platform, which will fully integrate with the Map Viewer to provide a powerful tool for the maintenance staff to look over the drainage area prior to fulfilling work the work order. DelDOT and New Castle County staff are using the tool for developing their water quality improvement plans. In conjunction with other planning tools, the viewer can help identify important features such as drainage areas, land ownership, and prime retrofit opportunities based on the age and condition of an existing BMP. Screenshot from the Map Viewer shows assets from a query and a list of possible actions, circled in red. But the NPDES map viewer isn’t just about inspecting and maintaining BMPs and infrastructure. It is also a helpful tool for fielding drainage complaints, and identifying and tracking outfalls for illicit discharge detection and elimination (IDDE). 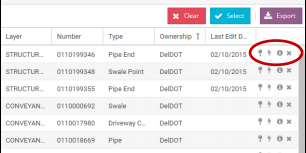 When citizens call the County or DelDOT to report a drainage complaint or potential illicit discharge, staff can use the tool to search the address of the reported discharge and perform a quick desktop analysis to identify stormwater flowpaths and schedule a follow-up site investigation when needed. Moving forward, there are even more opportunities to expand the benefits of the map viewer. The plan is to eventually expand the tool to include information on DelDOT maintenance yards (covered under an industrial permit) and construction site erosion and sediment control inspections. DelDOT and New Castle County are also hoping to continue adding data on assets managed by the smaller cities and townships within the State. Those smaller communities can integrate their data into the viewer, with QA/QC help from a shared vendor, and access their own version of the tool. While this tool was designed to meet the unique needs in Delaware, many communities are beginning to make use of similar asset management tools. With an ever-increasing number of stormwater assets to track, maintain and report, it is valuable to think about how your community is handling its data and whether it meets your needs. Thinking about the data you want to track, how you want to use it and who you’d like to have access are critical steps that will save time and effort in the future.